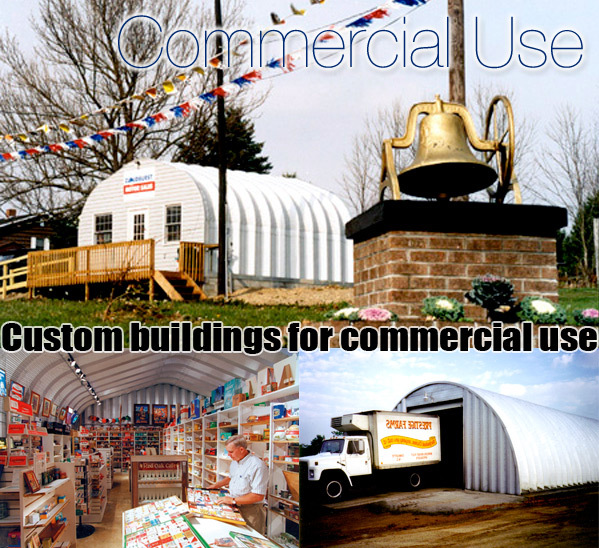 Archcore commercial steel buildings are gradually overpowering conventional construction methods. Durable, yet easy and fast to assemble, they are extremely cost effective and make Archcore the ideal choice. Arch Commercial metal buildings have a longer life span with less maintenance because they are manufactured with Galvalume steel and come with a 35 year warranty. Our commercial steel buildings offer a wide variety of uses ranging from small retail stores, warehouse facilities and steel office buildings. Since they are 100% clear span and do not have any posts or beams you can design the interior floor layout to suit your own needs. Since the arch spans are so strong, any customized endwall can be installed to complement your commercial enterprise. Prefab buildings are stronger and fire resistant unlike wood frame buildings. A nice feature with Archcore is the ease of expansion in the future. Archcore buildings are very easy to expand onto the length, which gives you the ability to plan for the future without paying for it today. With widths up to 140' and endless lengths, Archcore is the perfect solution. Take advantage of our straight sidewall models, as Archcore commercial buildings are ideal for putting shelving or stacking pallets or large store displays right against the wall to maximize your space. Their low cost and fast construction time also make them ideal as pre-fabricated office buildings. No commercial steel building is too large or small. Archcore has a commercial building solution for you! !